Meanwhile, in another part of the DC Comics universe… Vertigo to be exact. Astro City is of course the well-known “different take on the super-hero concept” comic written by Kurt Busiek. All sorts of characters waltz in and waltz out of its pages, and in Astro City #23, it’s an ape. 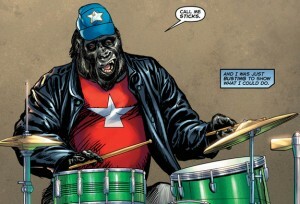 Yes, Sticks is a talking gorilla, but he’s not in town to be a superhero… he just wants to play the drums in a rock band! This first issue of a 2-part story arc is illustrated by Brent Anderson with, of course, a painted cover by Alex Ross. Look for it now.